has the highest diversity of succulent plants in the world (4 849 species, of which 1 940 are endemic), as well as eerie coastal mists, alluvial diamonds and truly indigenous cultures. To its west is the cold and rough Atlantic Ocean, while the remarkable Orange River, the largest river in South Africa, winds along its northern border. Two of the most fascinating plants found in the Richtersveld are the kokerboom, or quiver tree, and the halfmens boom, or “half human tree”. Green succulent “leaves” sprout from the top of many root-like branches on the kokerboom, which are hollow – the San people used them as quivers for their arrows, thereby naming the tree. Activities on the Richtersveld Route include hiking, 4x4 trails, birdwatching, mountain biking and donkey-cart rides. Artists, seafood lovers, geologists, photographers and those interested in indigenous culture, diamond mining and desert living will all find the Richtersveld enchanting. Drive inland towards Eksteensfontein and Sendelingsdrift, and you will reach one of South Africa’s foremost World Heritage Sites: the Richtersveld Cultural and Botanical Landscape World Heritage Site, bordering the |Ai/Ais-Richtersveld Transfrontier Park. The Richtersveld Route not only traverses the unique and diverse park, but also a number of traditional Nama settlements dotted along its edge. Here, time seems to have stood still for a thousand years. When you travel deep into the Richtersveld you will have a persistent feeling of being far from anything familiar. You may even feel as if you are on the movie set of Indiana Jones given all the strange plants, landscapes and rock art. The natural attractions will give you goosebumps – make sure to add the Richtersveld to your itinerary when choosing your next adventure. If you decide to leave your vehicle and explore on foot, keep an eye out for the small plants growing in the many quartzite crystal patches, and take some time to admire the 10m-high giant quiver trees, and oddly shaped botterboom (Tylecodon paniculatus). Engage low range along the 600km Namaqua 4x4 eco-trail route as you approach Vioolsdrift on the edge of the Richtersveld. Driving a 4x4 trail is a given when you travel through the Richtersveld. Making your way up Domrog Pass and down Akkedis Pass past the Hand of God rock formation will provide enough adrenaline for the day. Criss-crossing the Helskloof area will test any 4x4 driver’s mettle. The Orange River offers excellent opportunities for river rafting and the best wilderness fly- fishing in South Africa. Plus, all of the Richtersveld is a mountain-biker’s dream. Spend a day following a traditional goat herder while taking unique photographs of the life of nomads. In the villages the locals will entertain guests with storytelling and traditional Nama step dancing for a small fee. Buy a traditional Nama waistcoat or a kappie to take home. Early-morning and late-afternoon hikes are recommended to soak up the ambience of the desert. And don’t forget to look for the many petroglyphs in the park. 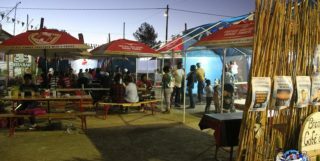 Great restaurants and a new hotel await you in Port Nolloth, but unpretentious community-owned guest houses are found in almost every village. These offer a good night’s sleep, and fine traditional food is available on request, including fresh-from-the-grid roosterkoek (South African bread that is cooked over a fire and is a farm favourite). 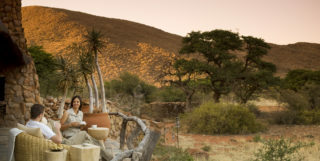 Campsites in the |Ai/Ais-Richtersveld Transfrontier Park offer beautiful views of the area. If you travel with one of the local guides, they will even put up your tent and can prepare meals that will delight a tired traveller. Port Nolloth Museum – This is a tiny museum with a rich history. Inside the museum expect to find porcelain shards from shipwrecks; slave bracelets that were washed up from a doomed vessel called the Black Joke in 1600; a Nama bible; and ostrich-shell fragments that were used by the Khoi and San as water containers. For bookings, contact +27 (0)82 642 6356 or email christo@springbokinfo.co.za. |Ai/Ais-Richtersveld Transfrontier Park – This park was formed in 2003 by the signing of an international treaty between South Africa and Namibia. The park straddles the Orange River border between these two nations. In the park, visitors can look forward to seeing wild game that has adapted to the harsh living conditions of this desert environment, including black-backed jackal, leopard, Hartmann’s zebra and duiker. For bookings, contact Hendrik Prins on +27 (0)27 831 1506 or email hendrikp@sanparks.org. Umkulu Safari & Canoe Trails – The Richtersveld is known for its clear night skies and desert mountains. Here you are guaranteed to enjoy the best stargazing in South Africa. 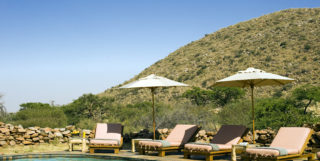 Umkulu Safari & Canoe Trails offers a camp in this arid region that is home to over 110 visiting bird species. 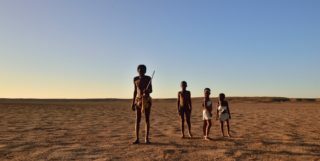 The company offers a variety of tours along the Richtersveld Route, including safaris in the |Ai/Ais-Richtersveld Transfrontier Park, river rafting along the Orange River, overnight camping under the stars, hiking trails and fishing expeditions. For bookings, contact +27 (0)21 853 7952 or +27 (0)82 575 3844, or email hennie@umkulu.co.za. Richtersveld World Heritage Site – The Richtersveld is a World Heritage Site consisting of three biomes – desert, succulent Karoo and fynbos. The mountainous and vast landscape offers an unending terrain of natural wonders, and is a great place to relax and recharge. For bookings, contact +27(0)27 831 2013 or email info@richtersveldwhs.org.